New interpretive signs will be installed at the site of the St. Augustine Mission and Christ Church Mission to help tell the story of the missions. 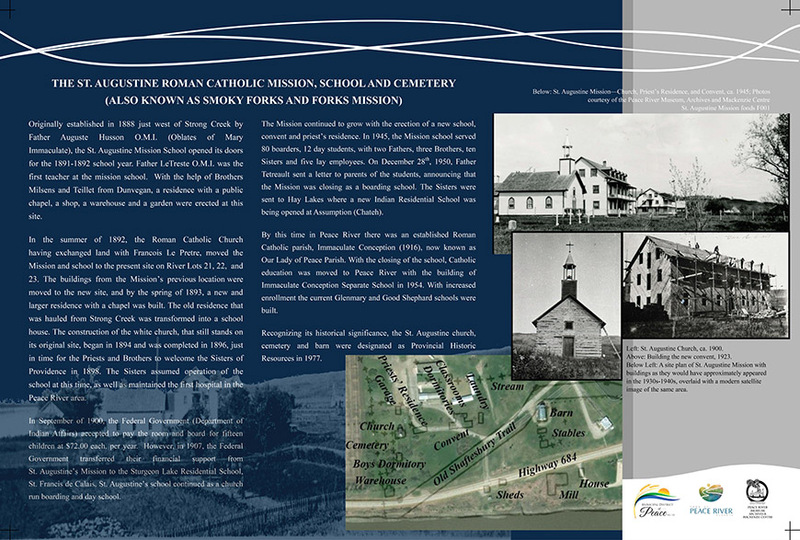 This project was lead by the Peace River Museum, Archives and Mackenzie Centre through the Town of Peace River. The creation of the St. Augustine Mission, School and Cemetery signs and the Christ Church Anglican Mission, School and Cemetery signs was in response to the Truth and Reconciliation Commission’s Calls to Action and stems out of earlier grave-site recognition conversations lead by previous museum staff. Both graveyards on Shaftesbury are of historical importance and the majority of graves of each are unmarked. Both sites were missionaries to the Indigenous in the 1880s to 1910s and served as important centres for early settlers. Neither site had detailed histories of the missions or the cemeteries, and by erecting these historical panels close to where the missions were, the public is able to learn more about these significant sites and gain an understanding of their layout, since few of the original buildings exist. In preparing for these signs Museum staff went to Edmonton to gather the archival information needed for the accuracy of these signs, in return, the Peace River Museum, Archives and Mackenzie Centre now have accurate information on the burials for each cemetery. A copy of the burials is available at the museum. Currently installation of the signs is planned for the fall, however, until they are installed they will be on display inside the St. Augustine Mission Church. If you would like to see the signs the museum welcomes you to the tours at the St. Augustine Mission site. Pictured: an example of one of the four signs that will be installed at the site.